If someone had told my teenaged self that I would wash out milk bags without griping, I would have laughed. My mother made us wash the 1 litre bags, find a place to dry them and reuse them for packing our lunches or for using them as freezer bags. Thirty years later, not only do I wash them out, but to my surprise, my husband does as well. And we’re not alone. They were among the tips emailed by readers who read the blog 10 simple ways to live frugally. Here’s to living lightly for Earth Hour and the other 8,735 hours of the year. Squeezing: Remember those toothpaste squeezers from the 70s? I don’t want one. But I do want to get the last drop from expensive moisturizing lotions. Once I’m unable to squeeze anything more out, I cut the end of the tube off and scoop out the dregs for another 4 uses. Wash baggies: Valerie Dixon tosses baggies (inside out) straight into the washing machine with the rest of the load. Watch out for pockets of water as you take it out of the washer. 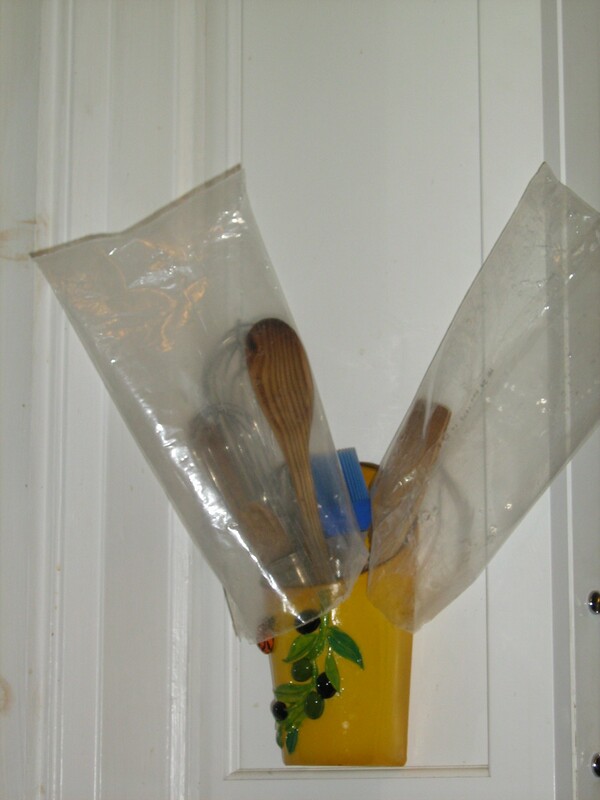 Vinegar: There a lot of uses for this solvent besides cleaning. Marlene Thompson adds vinegar to the rinse cycle instead fabric softener and when she washes her hair she uses a little vinegar and water mixture as a rinse. Cereal boxes: Barbara Bowen and her family use the wax paper liners to shield food in the microwave to prevent splattering, or for storing fresh-baked cookies and muffins. Bev Kennedy emailed that she uses it to depose of kitty litter. According to author, Ken Thompson, in his book, Compost, the cardboard boxes can go straight into the composter. Fireplace pilot lights: A reader emailed that she turns the fireplace pilot light off in the spring to save gas charges and relights it in the fall. She also thinks that the flame works against your air-conditioning (ditto for turning off audio visual equipment since the enormous amount of heat that`s generated has to be cooled). James Dulley, who writes columns on energy-saving topics, agrees about the pilot light. He told The Charlotte Observer that if you are comfortable turning the pilot light on, then go ahead and turn it off if the fireplace is used infrequently. In his Cincinnati home it saves him roughly $13 per month but, more importantly, he isn’t letting the updraft caused by the pilot light send heated air up the chimney. Cooking water: Reader June Nash uses the cooking water from vegetables and in soups and gravy. As June says, “nutrients leached from the vegetables are now saved and it adds its own unique flavour.” I agree. I curse when I throw the water out and then don’t have it for gravy. Also try using the veggie water for rice. Newspapers instead of bags: Reader Marlene Thompson lines the kitchen green bin with newspaper instead of buying biodegradable bags. She says that newspaper seals in the garbage and there’s no odour. I’ll be trying this tip for our next load. Composting: Put vegetable scraps into your composter not your green bin. Who needs a gardening centre when you can make your own black gold? Add tea bags and coffee grounds to the mix. At my house, I just knock my grounds into the front garden from my porch. My roses still bloom. Lower your thermostat: Elizabeth Kroeker and her family keep their home at 17C all winter long. Feel cold? Put on a fleece vest. The last is a plea for the person “Marivan” who said they have a soap mold – We would love to see a photo of it.